A recent conversation about how much food you can buy at grocery stores for $32 sparked fierce debates between dozens of Reddit users. The argument started when one user posted about a recent shopping trip that cost her $32 even though she didn't buy much: various kinds of fruit, some nuts and a soda. She complained about the rising cost of healthy options, noting that it was cheaper to buy junk food or McDonald's. Others on Reddit disagreed, arguing that, while it takes some work, you could eat healthy, even for a full week, on $32. Could I restrict my food spending to $32 for one week and still make decent, satisfying, reasonably healthy meals? I decided to try it and see. I challenged myself to create a week's worth of budget-friendly, nutritious menus, noting that there are plenty of Americans who must do just that on even less. The average Supplemental Nutrition Assistance Program (SNAP) benefit in 2018 amounts to roughly $1.40 per person per meal. My meal plan included pasta salad, rice dishes, pan-fried chicken and a kind of frittata. For the purposes of my test I assumed that I would already have on hand pantry staples like oil, salt, pepper and seasonings, as well as condiments like ketchup and mustard. 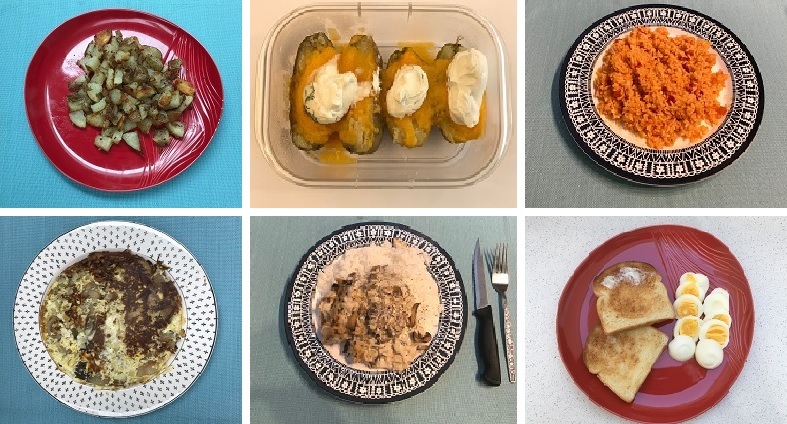 A sampling of the meals made with a $32-a-week grocery budget. Source: Megan Leonhardt. The final shopping list for 21 meals came to 23 items. I took that list to four popular grocery chains: Acme, Aldi, Trader Joe's and Whole Foods. Here's how I fared trying to buy my ingredients for just $32 at these stores, ranked in order from most difficult shopping experience to most successful. The entrance to Whole Foods in Edgewater, New Jersey. I walked out of Whole Foods without even attempting to scan and buy my items. The store was just too expensive. I couldn't figure out a way to make $32 work with the meals I had designed, and that's even after I cut corners and put back all the items that I could live without. I cut down all my vegetable requirements by half, for example, and I was still over by almost $8. It's not shocking that Whole Foods is expensive: The store is often called "Whole Paycheck" for a reason. But I had hoped that Amazon's takeover had lowered prices and that, by sticking to the store brand 365 Everyday Value items, I could make my budget work. I couldn't. The multi-pack bags of potatoes and onions, while a good value, were out of reach, so I would have had to pay more (proportionally) for individual items. And it wasn't just that having less cash on hand meant I couldn't save by buying in bulk: Even store-brand basics like bread and rice were at least $1 more than than elsewhere. I really appreciate having a national grocery chain that prioritizes sustainable and organic products. I just wish they could make it more affordable. The produce section of Trader Joe's in Edgewater, New Jersey. I love Trader Joe's, so I was incredibly disappointed to find the store busted my budget. I almost scraped by, but Trader Joe's has certain items only seasonally, so I was unable to purchase a few of the necessary ingredients on my list. The store near me doesn't stock canned mushrooms and cream of mushroom soup during the summer months, for example, which meant I had to purchase fresh mushrooms (surprisingly, they were cheaper than Trader Joe's frozen medley) and some half-and-half to make my own version of the creamy soup that I needed for a recipe. The store also didn't stock cream of chicken soup, so I needed to completely re-think one of my planned meals.The higher prices and the lack of ingredients meant I had to improvise recipes as I stood there in the aisle. That said, there was a lot of value to be had at Trader Joe's. Its offerings aren't the cheapest, but the products are usually a step up in terms of quality. I was able to get a whole bag of organic red potatoes for less than the average Russet potatoes offered at Acme or Aldi, for example. The entrance to Acme in Port Imperial, New Jersey. Before hitting the aisles of Acme, I checked prices ahead of time. Turns out, that was a waste. Once I arrived at the store, many of the items I needed were not available at the advertised price. The chicken that was supposed to be on sale for $2 per pound was nowhere to be found. The only chicken left in the case came in massive packs that were roughly $15 each, and the gentleman at the meat counter wasn't exactly willing to re-package in a smaller portion. If I were shopping for the whole month, I might have been able to justify the expense. I ended up purchasing a much less healthy option: Tyson breaded chicken fingers. The bag was on sale for $6.99, which made it the cheapest kind of chicken Acme had that day. It wasn't just the chicken, either. I had to stop shopping multiple times to open up the calculator app to tabulate my expenses because the prices on items like potatoes, onions and eggs were different than expected. I was reminded of a recent essay on poverty by Erynn Brook, where she explained that, when she didn't have a lot of money, "grocery shopping required complex math." I had to put back an onion at the checkout because my arithmetic wasn't quite up to par, which was embarrassing. In the end, I wasn't able to get everything on my shopping list, but I was able to get enough to last me through the week if I scrimped and cut a few corners. Instead of picking up some frozen or canned fruit and vegetables I planned to use as sides, I instead wound up using more potatoes, for example. It was cost-effective, but it also made for a pretty repetitive, and less nutritious, week of meals. An aisle view of Aldi in New Jersey in August 2018. If you've never shopped at Aldi, you're missing out on some huge savings. The stores are a bit basic — no fancy hand-painted signs like Trader Joe's — but I'm always impressed: It has quality products at great prices. At the other grocery stores, in order to make my budget work, I generally had to forgo many of the dinner side dishes I'd planned, like green beans, and lunchtime extras like apples. But at Aldi, not only was I able to get all of the planned sides, I was able to go beyond just the basic can of green beans. For the same money, I found I could buy whole bags of frozen peas and frozen green beans — which are healthier than canned and provide an extra serving of vegetables that could be used to bolster my pasta salad lunches. I also could afford to save by purchasing whole bags of onions and potatoes at Aldi, rather than having to buy produce piece by piece. I snagged some organic products, like spaghetti noodles and canned tomatoes. And Aldi had several fresh chicken options that were all within my budget. I opted for a package of six boneless skinless chicken thighs, but I could've gone with the fresh boneless, skinless chicken breasts and still stayed within bounds. Best of all: I was able to get everything on my list at Aldi and even had money left over. I was actually $6 under budget! That made shopping here far less stressful and, dare I say it, enjoyable. Even after I wrap up the challenge, I'll be shopping more at Aldi. This chart breaks down the prices I found for all of the items in my recipes at the four different stores I tried. Note: Aldi U.S. and Trader Joe's are independently operated companies with distinct but once-related corporate parents. It could be said that Aldi and Trader Joe's are "estranged cousins."